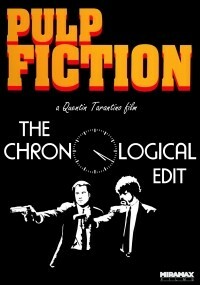 This edit depicts the events of Pulp Fiction in chronological order. To achieve one continuous timeline, temporal redundancies had to be avoided by merging those scenes together. The movie now structures as follows: Butch's childhood memories - Title sequence - The Bonnie Situation - Vincent Vega and Marsellus Wallace's Wife - The Gold Watch - Credits. 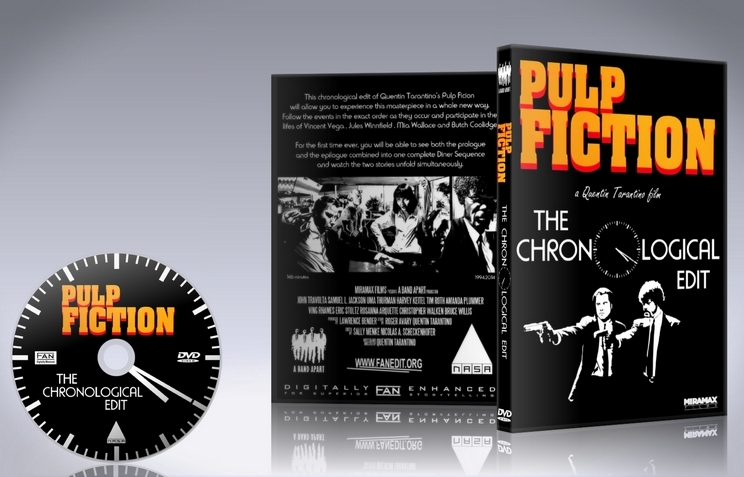 Since I'm a huge fan of Tarantino and Pulp Fiction in particular, I wanted to find out how it would alter the feeling of the movie and the overall pacing of the story, if the events were told chronologically. This edit is to be seen as an experiment and - by no means - tries to be an improvement over the original. In the original movie, there are two major cases of overlapping time. The fist occurs during the opening prologue, where Honeybunny and Pumpkin talk about robbing the diner. But while they are talking, Jules and Vincent are actually sitting only two tables away eating breakfast - which is the final scene of the original movie. The second one takes place while Jules and Vincent visit the hotel room to get the briefcase. After they shot Brett early in the movie, the scene fades out. Near the end of the film, the same scene is revisited just before Brett gets killed and introduces a guy with a gun hiding in the bathroom. So most work was done on these redundant scenes, to merge them each into one respectively.